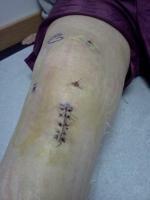 I had arthroscopic surgery for a torn meniscus. I was sent home, no crutches, no limits other than no running or squatting. After the block wore off, several hours later, I could not bear weight and barely ambulate. I did have some old crutches here and used them for seveal weeks. Had the sutures removed, they said I was doing great. 2.5 weeks later, I tried to get up and the knee would not work and pain was unbearable. I could not ambulate at all. Is this normal? I ask the PA who removed the sutures if I accidently hyperextended the knee would it hurt anything? Her comment was it will hurt you, but not the knee. This recovery has been extremely painful for weeks, is this normal? They virtually have given me no limits, now I am worried I have damaged something from walking and bearing weight. I know I never want to go through this again.